No tickling for 4-6 weeks. Sebastian still knows how to have fun though! There's no too ways about it: it's not fun to have two broken arms. It's not much fun to be the parent of a kid with two broken arms either. He's completely helpless: he can't do anything that requires the use of his hands, which pretty much covers the entire spectrum of human experience. he can't even get in or out of a chair without help. It's alot of work, especially with Meredith away on her book tour. It's impossible not to feel pity for him but I often find myself feeling sorry for pitiful me, who basically just had his life put on hold at an extremely busy time. At those moments, I try to remind myself that I'm not the one with the broken arms; he is. However cranky I may feel, he has it a million times worse. Yet Sebastian has remained in relatively high spirits. He occasionally complains or moans or even yells but I think he's entitled. It can only be frustrating and obviously painful, yet he still does his cute little dances and makes his silly jokes and is [mostly] a fun person to be around. There are some very small side benefits as well: no more wiping his mouth on his sleeve at the dinner table, for example. There's always a bright side, right? Sometimes you just have to look really hard to find it. I am very fortunate to have such a child, and he's fortunate to not be hurt much worse. We are, all of us, very fortunate indeed. My son, Fabian, age 10, is wheelchair bound since he fell from a tree two years ago. It was a very hard time for all of us after Fabians accident. The moment when the doctor told us, that Fabian is paralyzed and the moment when we must told him that he never walk again, was so terrible. Especially terrible was the day, when Fabian got his first wheelchair. I still cry when I saw him sitting in his wheelchair at the first time. But Fabian is so brave! I am so proud of him. Since his accident Fabian visits a school for special needs kids. All other kids in his class are disabled, too. The most kids must use a wheelchair, tree kids can walk with a walker / quad canes. Every Saturday Fabian visits a sport group for children in wheelchairs. Two hours they play together in their wheelchairs. It is so funny for the kids. Two month ago he got a new “Spidermann”-wheelchair. If you are interest I will send you some photos of him before his accident and in his new wheelchair. When Fabian was 5 years old, he broke his left arm. In hospital he get a full arm cast for nearly six weeks. 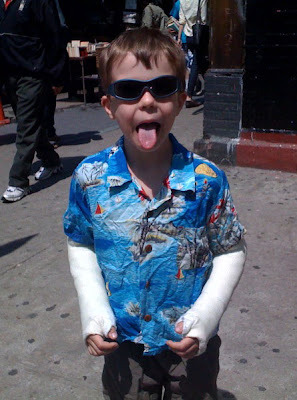 All his friends signed his cast. When the cast comes off, Fabian had a mulit colored work of art. I hope all friends of Sebastian sign his casts and he will become two mulit colored work of art, too. I will be glad about a short answer mail.